In a recent webinar presented by Ana Morfesis titled “Characterizing the zeta potential & Isoelectric Point of Nanomaterials” we got such a good turnout that we were not able to address the numerous questions asked during the event. Since there was such strong interest, we have provided the following list of questions and answers to benefit all who are interested. 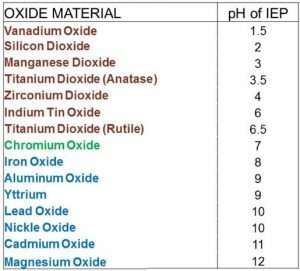 We have also provided a table of common metal oxide IEPs, as shown to the left. For those who were not able to attend the live event, the session was recorded and is available for replay. 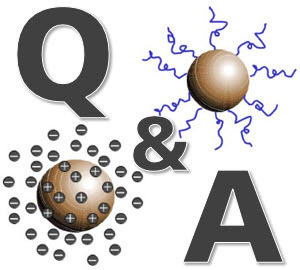 Q: ­Can we estimate the surface charge per area of nanoparticles from their zeta potential values? The applied voltage of any stored zeta record can be found by adding it to the records view, to edit the workspace follow this blog ( under the heading how to display a custom parameter, FAQ editing workspaces) and add “Measured Voltage” to the records view, or simply add the “Voltage and Current (M)” plot to the workspace so that becomes an available report. To determine which voltage to apply, the easiest would be to let the system use auto mode. As an alternative, for sensitive samples, manually select the voltage such that a good phase plot can be obtained. 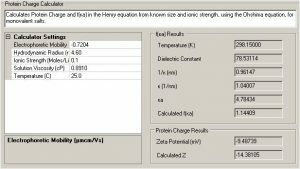 For guidance, this post on high ionic strength samples may be useful. If samples should be measured in nonaqueous dispersions, then for zeta potential the best would be the dip cell ZEN1002 in conjunction with the glass cuvette PCS8501. For size only, the solvent resistant low volume cuvettes ZEN0040 may be suitable, depending on the solvent used. There is a technical note on Non-Aqueous Particulate Suspensions with additional details. The zeta potential should not be size dependent. So the often-applied “rule-of-thumb” of ~30mV would be suitable for very small ~nm sized nanoparticles up to several microns. This is quite a tricky questions. For most purposes, the point of zero charge PZC is equivalent to the iso electric point IEP. Some publications consider the PZC to be made up of all charges, and the IEP to only include surface charges. 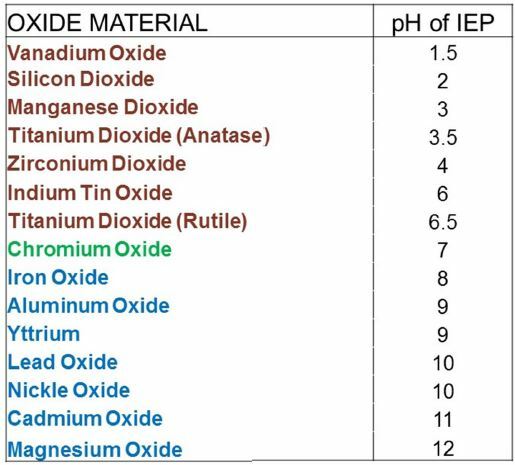 However, the IEP is usually measured by titration and electrophoretic mobility and will include (interactions with) the (nearby) ions of the surrounding buffer medium. The IEP can be measured by electrophoretic light scattering using a titration versus pH. Yes, it is possible to measure the electrophoretic mobility of non-aqueous dispersions. The utility of zeta potential per se may be questionable, as the theory is really only defined in aqueous media. However, the overall mobility due to an applied field can still provide information on the overall charge of the particles in organic media. There are two special cuvettes that are used for samples that are not prepared in water: The dip cell ZEN1002 in glass cuvettes and the high concentration zeta cell ZEN1010. Also, check this Technical note on Non-Aqueous Particulate Suspensions. Q: ­Can steric stabilization stabilize a system that zeta potential predicts would be unstable? Yes. Steric stabilization alone can be the cause of a stable colloidal dispersion. Charge stabilization is often encountered in aqueous samples, and many formulations acquire stability through a combination of electrostatic and steric stabilization. Even a system with a relatively low zeta potential may thus still be stable when steric stabilization (also known as excluded volume interactions) are present. Also, check this technical note on stability and zeta potential concepts. The electrodes corrode due to electrochemical redox reactions. The corrosion process is dependent on applied voltage, applied on-time, and the conductivity. If there is less salt in a buffer then this will reduce but never prevent the oxidation of the electrodes. If the sample and data quality allow, the applied voltage may be reduced. To reduce these effects it may be a good idea to set the maximum number of subruns to 20-40 in the automatic mode. Typically, if the phase plot has not been repeatable by the ~30th subrun then there may not be much point in collecting much more. You may also find the diffusion barrier method of interest and an application note on polymer coated silica spheres, size and zeta. 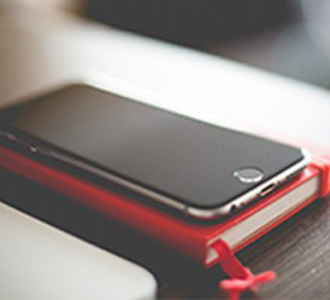 Q: ­Can we measure the isoelectric point of cationic polymer solutions using your equipment? The Zetasizer can be used to obtain the zeta potential of polymer solutions in water. Measuring an isoelectric point involves preparation of several samples at different conditions (pH). The sample preparation can be automated with the automatic titrator MPT2 accessory, that can handle up to three titrant bottles. 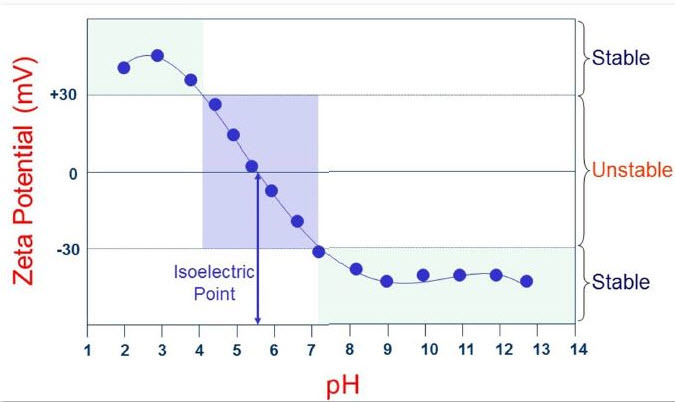 See this application note on automatic determination of Isoelectric Points. Q: ­If flocculation occurs during the zeta potential measurement, will this affect the results? If your sample is already flocculated then there is no specific harm in measuring zeta potential: as long as there is a good quality phase plot, the system can determine the zeta potential of particles up to 100 microns. If the flocculation happens during and as a result of the applied voltage, then this suggests that there may be some electrochemical interaction leading to sample degradation. It may be good to study if the sample still flocculates without any applied voltage (i.e. just sitting in the cuvette for a few minutes) or if a reduced applied voltage does not cause flocculation. See also this technical note on maximum size 100 microns for zeta potential. Q: ­What is the difference between surface zeta potential and zeta potential as indicated in the Malvern Nano series? The zeta potential is the effective potential of the particle at the slipping plane. The surface zeta potential is the extrapolated zeta potential of a flat surface as obtained from the measurement of probe particles as a function of distance from a charged surface. Details of the measurement technique are described in this application note on surface zeta and with an example application for silica material. Watch the training video for the surface zeta method on the Malvern youtube channel. Zeta potential is a system parameter, that describes the electrostatic potential at the slipping plane of diffusing particles in an aqueous medium. Zeta potential cannot be measured in air or in solid form. If the powder can be dispersed in a liquid for example water, then the zeta potential of the dispersed particles in that liquid can be measured as long as the particle size is smaller than 100 micron and sedimentation is slow enough to allow completion of phase plot data of suitable quality. That is an excellent point. The rule of thumb of 30mV came from experimental experience. At that voltage, the electrostatic repulsion between particles is typically stronger than the random thermal Brownian motion, and prevents particles from accidentally “running into each other“. Some advice is given in the “Expert Advice” tab during live measurements, as well as when highlighting related repeated runs. If there is more or less a consistent trend in one direction, then this may be a temperature effect. The sample may need more time to equilibrate before starting the measurement, or it may be prudent to include a wait time in between repeated runs if Joule heating is causing the drift. The count rate for the zeta measurement should be sufficient to obtain a good phase plot. The zeta quality report should flag this if the counts are too low. This could be overcome by increasing the concentration of the sample. (An exception to this recommendation are absorbing samples, here reducing the concentration may improve since light has to pass through the cuvette to get to the detector on the other side of the cuvette). The Zetasizer should be able to handle a wide range of sample concentrations as long as enough unscattered light is transmitted. As a vague rule: if one can read a newspaper through the sample, then it should be OK for measurements (incidentally this also applies to traditional 90-degree scattering optics for size measurements). The isoelectric point will only change when an effect called specific ion adsorption is taking place. So, if either the sodium Na+ or the chloride Cl- ions specifically bind to the surface of the iron oxide particles then a shift could happen. To our knowledge, there is no way to entirely predict this, except to determine it experimentally. (or try to check if research has been published, yet often particles are produced and stabilized differently, which would alter their iso electric point). 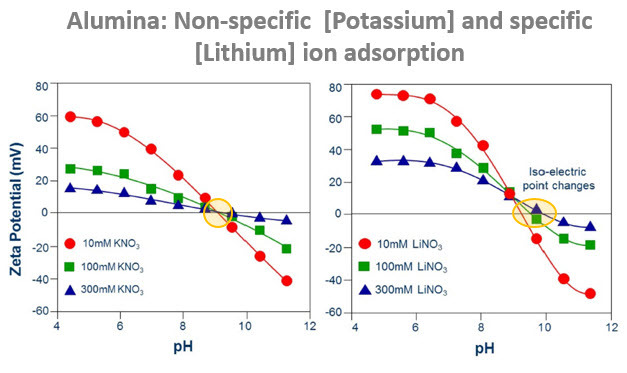 Here is a graph summarizing the effect of specific and non-specific ion adsorption in Alumina samples, as observed by the overlap (non-specific) and the shift (specific ions are adsorbed) in the isoelectric point. Q: ­When you perform a pH titration on a sample that is at pH8 as-is, how would you titrate the sample if you want to make measurements from pH 4-12? How do you account for the addition of ions from acid and base when you do? There are many ways to perform a titration, and they will lead to different outcomes because the zeta potential is a system-dependent quantity. In other words, it is not possible to fully describe a sample with “sample at pH7” instead of a full description of the components of the surrounding buffer and conductivity, ionic strength, ion types, pH, additives,… would be required. To perform a simple titrator, you could go with HCl and NaOH if that is suitable to your sample. If there is a desired additive in the sample (maybe another component like 100mM sucrose) then this must be included at both end points (i.e. the acid and the base used should contain this component). The change in conductivity is part of the experiment, and that is why the conductance is recorded. A typical titration plot showing the isoelectric point and the unstable and stable regions when electrostatic stabilization is involved is shown below (this is for coffee compliment). The overall charge will be a result of all components in the sample. Naked gold is probably strongly negative, adding thiol may increase that negative charge, carboxyl chains may move the slipping plane out further and thus reduce the strength/magnitude of the zeta potential. See also application note on colloidal gold. Q: ­I know that in order to get a correct zeta potential value of any particle in aqueous solution you have to use an electrolyte support, however some papers dealing with nanoparticles state that this is not necessary and they use only deionized water, is it correct­? The type of water does not really matter as long as it is clean of dust. What is more important is how to interpret the data, and when comparing samples that the exact same dilution is performed if any meaningful conclusions are to be drawn from the data. Please check this publication “Some Surface Characteristics of Six Hematite Ores from the Middleback Range Area, South Australia” International Journal of Mining Engineering and Mineral Processing 2012, 1(2): 73-83 where this effect is also reported. Q: ­How do you test the particle size in the sunscreen you presented here? Q: ­I am working on herbicide formulation. It is 30% suspension. But it has to be at pH3 for good stability. What should we do to move the pH to 5-6 to still keep the stability? You may be able to add a modifier combination like APMA/PEG. This application note for a different but similar problem might be an inspiration “The importance of zeta potential in ceramic processing – Alumina“. The electrodes are made of copper with a thin layer of gold. This electrode material can be oxidized by electrochemical reactions. The electrodes are probably still usable, however it would be best to confirm this by measuring a standard (for example zeta potential transfer standard DTS1235). The blackening is less rapid with lower conductivity samples, less subruns, and lower applied voltage. The disposable zeta cuvette DTS1070 can be used to make zeta potential and size measurements. The cell is not designed for static light scattering measurements, where higher quality (typically quartz) cuvettes are required to avoid any artefacts due to slight manufacturing tolerances. For example, some flare from plastic cuvettes may contribute to the overall intensity. This does not matter for dynamic light scattering where only the intensity fluctuations are analyzed. But for static light scattering the total intensity is measured, and those flare contributions would interfere with the amount as one cuvette may be slightly different from another (and also the re-positioning of the same cuvette may have that effect.) You are welcome to test this by comparing the scattering from a concentration series as measured with a larger glass cuvette and the zeta potential cuvette. Please note that a workaround is required in the software to select any available cuvette but then to force the measurement position to 5.5mm since the DTS1070 cuvette is not available for molecular weight measurements in the software. Q: Is it advantageous to sonicate samples before analyzing the ZP? How effective are these with particles that for aggregates in solutions? In particular, I am working with Regular Starch Particles and Nanoparticles. Sonication may be helpful to break large agglomerates and allow measurements before particles completely settle out of the dispersion. It would always be good to check that the sample is then stable over time after the sonication, and that the particles do not just aggregate back again. Another tip may be density matching the dispersant, for example by adding sucrose. 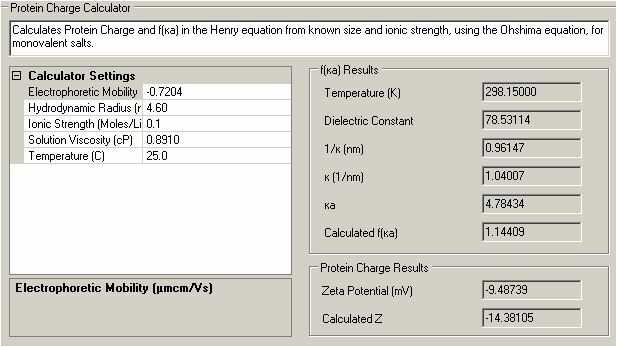 We have been able to determine zeta potential for particles with 100 micron diameter. Q: You said high concentration cell can manage suspensions with max. 10w% sample inside. Which concentration can the disposable capillary cell manage? When varying the pH, does in every suspension exist an isoelectric point? I saw a publication without IEP, which confused me a little bit. The maximum concentration is sample dependent if the sample is quite clear up to some “opaqueness” it should still be measurable. In practice and for many samples this is likely in the fractions of a percent region. Not every sample has to have an isoelectric point. If the stabilization is entirely non-ionic and only based on steric stabilization then the material could remain uncharged over a wide pH range. Hope the next time you are looking for the charge of dispersed nanomaterials the above tips and hints can help.